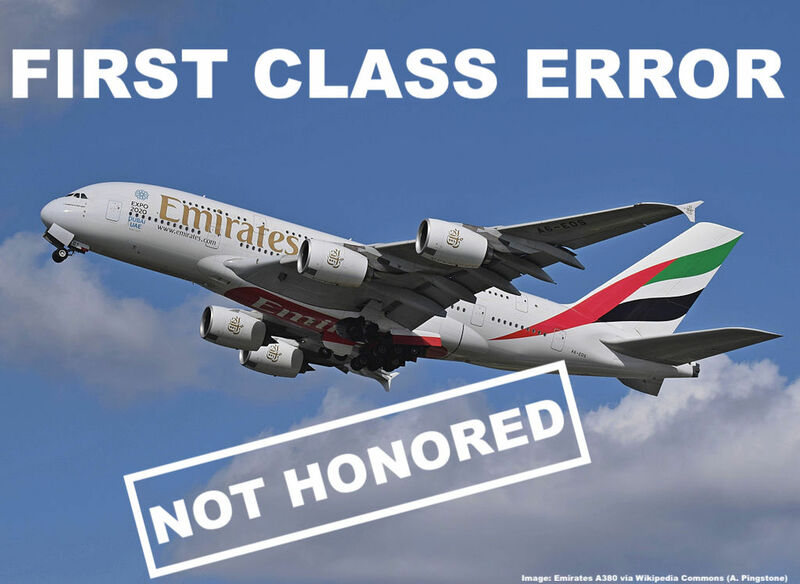 Reader Question: Cancelled Emirates First Class Error Fare ex Kuala Lumpur Issued By Malaysia Airlines – Compensation Offered! I got an interesting Reader Question today asking how to handle the cancelled Emirates First Class Error Fare from Kuala Lumpur to Dubai and a compensation offered to him by the issuing airline (MAS). Background of this question is that around January 4/5 there was a fare available originating from Kuala Lumpur and other South East Asia gateways to Dubai in Emirates First Class as a Malaysia Airlines codeshare flight for ~US$1,300. Malaysia Airlines was also the airline that issued the ticket. People who booked this ticket found their reservations cancelled within a couple of days. Customers have been stonewalled by Malaysia Airlines which didn’t surprise me. Actually the fact that Malaysia Airlines and Emirates were involved made me pass on this from the get go. In any case the tickets are now dead and won’t be honored but based on the readers email he was offered something by Malaysia Airlines Customer Relations after he complained through MAVCOM which I advised him to do. thanks again for your idea to complain to the Malaysia regulator. MAVCOM handled my complaint and I got a reply from Malaysia Airlines. They won’t re-activate my ticket but offer a full refund and also an MH Economy Class ticket to a destination of my choice, Europe not included. Should I take their offer or is there any option of negotiating something better? You will receive a full refund of your ticket purchase in accordance with the refund timelines provided by Expedia where your ticket was purchased. This might take several weeks and we advise to contact Expedia for more information on that. Rest assured your refund has already been authorized. You will be given a free return ticket or single sector (point-to-point) on Economy Class. Jake lives in Kuala Lumpur and had purchased his ticket from there as well. Buying from KUL was ~ $300 more expensive than other gateways but nevertheless. What’s my take on the compensation offered to him? It’s a goodwill gesture by Malaysia Airlines and even though it’s Economy Class it has a decent value when booking one of the more expensive destinations such as Korea or Japan. There might even be the option of upgrading the ticket per bidding or at the airport against a fee. Considering how many airlines have just cancelled their tickets and not offered anything I would be reasonable and take MH’s offer and use the ticket in an efficient way. I’d also ask an Expedia Supervisor for some compensation. They have previously given me vouchers good for hotels and flights, usually $100-$200 per ticket, when Errors got cancelled. You should specifically ask for such a customer service voucher. I’m convinced that you only get somewhere with Malaysia Airlines if you complain to the government regulator (MAVCOM) because their customer service is horrible and they usually ignore customer requests. Emirates is not the proper point of contact here as this was a codeshare flight and to be honest their service is equally bad and there is zero worthwhile consumer protection in the UAE. I didn’t book this deal for many reasons. For one I expected MH/EK to make trouble and not honor this, on the other end it’s pretty much impossible to credit the miles from these flights somewhere worthwhile because the rules of most frequent flyer programs say that these flights (MH/oneWorld codeshare on a non-oneworld Airline) are ineligible to collect miles. Qantas Frequent Flyer or Alaska Airlines might have worked but that’s a moot point now.